It was wonderful to see you at the first Cooking Matters Meet-Up of 2018! 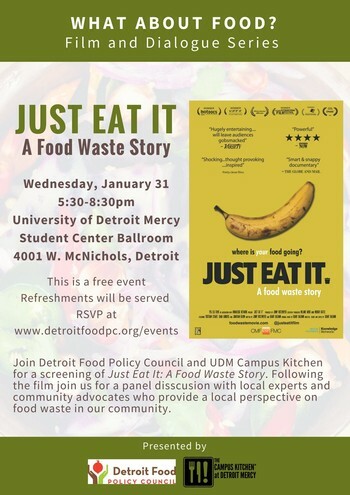 Cooking Matters Volunteers and Staff joined the Detroit Food Policy Council at University of Detroit Mercy for a screening of "Just Eat It." In this documentary about food waste, filmmakers and food lovers Jen and Grant decide to quit grocery shopping and survive only on discarded food for 6 months. Local experts and community advocates participated in a panel discussion following the film. Among the panelists was Cooking Matters Volunteer, Kevin Kay! Thank you so much to those who could attend! For those who could not, we hope to see you at the next event! 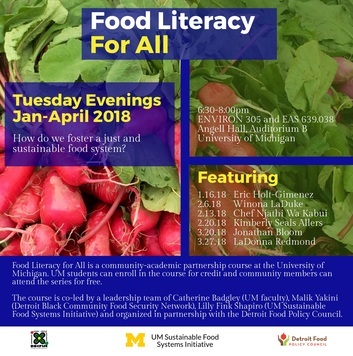 This University of Michigan open course is offered in partnership with the Detroit Food Policy Council. Reach out to Carolyn Sagi with any questions, csagi@gcfb.org, 313-308-0585 (o), 313-580-9822 (c). Of course, thank you to ALL volunteers who do so much for the Cooking Matters Program, and our community!! After we watched Just Eat It: A Food Waste Story at the January volunteer meet-up, we wanted to know how we could help. We turned to Kevin Kay, one of the panelists at the screening, a Cooking Matters Volunteer, and Chair of the Food Waste Subcommittee at the Detroit Food Policy Council (DFPC). He could not believe the answer he received. Tomo explained that companies fear the possibility of litigation if someone gets sick. After some research, Kevin found the Bill Emerson Food Donation Act. The Act shields donors from civil and criminal liability – they cannot be sued if someone gets sick from their food. Additionally, he found that businesses can even receive a tax break when they donate food. Kevin called Tomo and asked if he had heard about the Act. There was a long pause on other end. “…No. I’ve never heard of that.” Tomo was intrigued. The more people in the restaurant business Kevin talked to, the more he realized that no one knew about this Act, which was signed into law in 1996. What are local organizations doing to reduce food waste, or make it easier to ensure food gets to someone who will use it? Kevin met with the Executive Director of the DFPC to talk food waste. She said the Council had discussed starting a Food Waste Subcommittee, but it needed a champion. Would he be interested in helping start the committee? Kevin accepted and hit the ground running. The Committee is currently working to start a pilot program in West Village where independent food businesses can donate any food that would otherwise be wasted to those in need. California recently passed legislation allowing donations from businesses directly to the food insecure, and the Committee intends to champion a similar bill in Michigan’s legislature. What are some solutions to food waste that are not happening yet, but that you would like to see implemented? 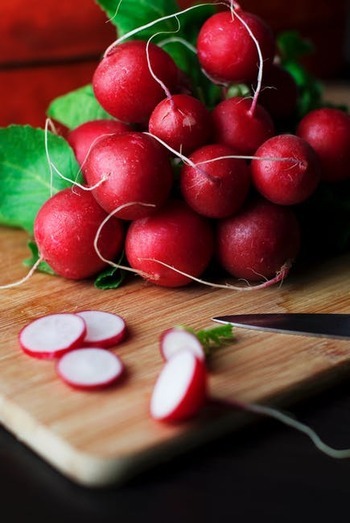 Kevin wishes that big food chains would use imperfect produce in their commercials – like a bruised pepper. With the reach and frequency of large food manufacturers’ advertising, the average person might then go to the store and hopefully feel comfortable considering an imperfect pepper. Moreover, companies can benefit from making zero waste part of their brand. Consumers are more socially conscious now, so if they see a brand going out of its way to divert waste from landfills, the results could be good for business, too. 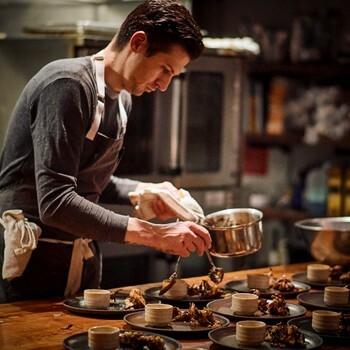 Seattle’s Table is a program offering table-to-pantry service for restaurants to get food waste to agencies. Kevin and the other members of the DFPC Food Waste Subcommittee are working to adopt this model for their pilot program. Finally, Kevin would like to see food waste incorporated into elementary education, like health class, to change the norms about waste from an early age. What can the average person do to reduce food waste? Plan, and be thoughtful about your purchasing. You may have good intentions about eating healthy, but then life throws a curve ball and you only cook at home twice that week. Make sure your intentions are realistic. Additionally, think about how food is packaged, and only buy what you will use. For instance, if you buy a whole head of lettuce, you should commit to using that lettuce before it goes bad. Kevin’s mantras are: frequency breeds familiarity, and consistency breeds credibility. He has learned that keeping the conversation going is the most important thing you can do. Our current norm is to waste food. Through education and some innovative programs, Kevin wants to normalize zero waste. Pantry coordinators often ask us to highlight unpopular items or encourage clients to take advantage of seasonal bounty. Mixing it up with new recipes and preparations can help! Feeding America recently partnered with Pampered Chef to put together videos on using commonly distributed food pantry produce items. From beets and radishes to tomatoes, cauliflower, pumpkins, and cabbage, there’s a video for every season. Click here to visit the list of videos. For more healthy delicious recipes, click to visit the Feeding America website. A panel discussion about the implications of the Farm Bill for our community food systems. The Detroit Food Policy Council Grocery Store Coalition will discuss initiatives such as a grocery store score card that offers community and store owners feedback about stores' performance. Presenters describe the Fresh Prescription program, where participants receive a prescription to "eat more fruits and vegetables." These great sessions, and more, including a discussion of food waste will be featured. Cooking Matters volunteers including Kevin Kay, Ben Hall, and Jason Murphy look forward to being involved. 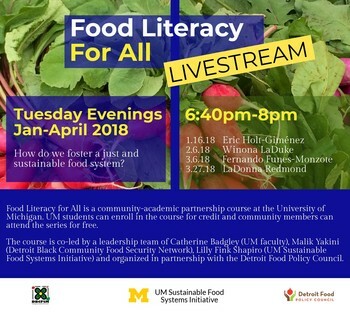 Click here to visit the Detroit Food Policy Council website and register. Many discounted registration options exist, including Early Bird, Friend of the Detroit Food Policy Council, and Volunteer options. LaDonna Redmond's lecture will be the second 2018 Cooking Matters Meet-Up! Cooking Matters Culinary Instructor, Craig Lieckfelt has begun a new initiative to help feed our hungry neighbors. He has founded a new soup company called Felt Like. For every bowl of soup sold, Felt Like provides a bowl of soup to someone in need. currently operating as a pop up series at Frame in Hazel Park, Felt Like's menu changes each weekend; exploring a classic soup preparation and providing a meal created around each soup. February 16, 17, and 18. February 23, 24, and 25. While Felt Like is a new endeavor, Craig looks forward to seeing the initiative grow organically. He currently partners with Capuchin Soup Kitchen to provide for the food insecure. Click here for additional information, and tickets. In November, December, January, and February, Cooking Matters Volunteer Advisory Committee Members worked extremely hard to attend events in Southeastern Michigan. The goal of these events was to recruit new Cooking Matters Volunteers. Volunteer Advisory Committee Members, Joanne Sycko and Kelly Voelker. Events began with presentations for 250-600 people, and were followed by opportunities for attendees to visit information tables to ask questions individually. Twelve events in total, these dedicated team members have reached over 5,000 people. AN ENORMOUS THANK YOU TO ALL INVOLVED!!! Special thanks to: Lee Visci, Nancy Geik, Kelly Voelker, Bob Greig, Joanne Sycko, and Mary Gisslander!! Laura is originally from Milford, and is proud to say that she has lived the majority of her life in Southeast Michigan. Detroit is a very meaningful community to Laura. "Having a background in nutrition, I love that I can share nutrition with the community that has been my home for most of my life." Laura has a bachelor's degree in nutrition, and a master's in public health, specializing in health education. 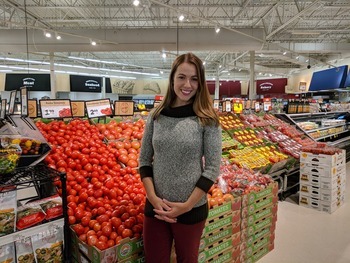 She was drawn to health education because she feels it is important that everyone has a connection to meaningful nutrition information. It is her goal to move people from information about what to do toward information about how to do it. She wants to help others build sustainable healthy habits. Laura had been looking for ways to connect with the community. She remembers her excitement on learning about the Cooking Matters program in Southeast Michigan. "I remember feeling so happy to learn this program exists in Michigan, and that I could be a part of it!" Laura loves to see how excited participants get when they realize they can do something that seemed impossible. She loves to empower others with nutrition information, and to see that empowerment come alive. "I love to see them realize, 'Oh, healthy eating isn't that far away. I can do this!'" Laura has several things she loves about Cooking Matters. Laura enjoys seeing participants have a great experience with the food they've made. "I love it when they love it!" She believes Cooking Matters offers the most important things participants can do to eat right, and makes the information accessible and actionable. Laura also believes it is important to celebrate the things participants are doing well. She appreciates that in the curriculum, and enjoys acknowledging participants' current knowledge. We will always finds "Lots of garlic!" in Laura's kitchen. Laura loves to find ways to flavor food that do not depend on salt. For that, she enjoys a variety of herbs and spices, in general. We will also find many items from Laura's garden. Laura is still working through her fall harvest of squash. She both stores, and decorates with her veggies. "When I finally cook all my squash, I'll have to find a new book end." Laura's favorite hobby is kite surfing. She loves being on the water in general, and is a member of a sailing team in Detroit. Laura also loves yoga and gardening. "My garden is my happy place. It's were I go to unwind." Laura loves to check on her plants to see how they're doing. During growing season, she goes straight into the garden as she gets home. She climbs over the fence to encourage her plants before she's made it inside the front door. Is there a recipe you would like to share? A high fiber, high protein breakfast treat that comes together in a simple coffee mug! 1) Mash the banana in the bottom of a tall mug. 2) Beat the egg into the banana. 3) Add 3 Tbsp of oatmeal and stir. 4) Add 2 drops of vanilla extract (or more, to taste). 5) Gently fold in frozen blueberries. 7) Dump onto a plate or eat in the mug itself! 8) Top with a drizzle of pure maple syrup and dollop of vanilla Greek yogurt.